Atlanta • Call it Atlanta Hawk shellshock. After a stretch of games in which the Jazz had easy blowout wins, it was evident from the opening tip that things would be different here Thursday night. The end result? A 117-114 loss for the Jazz on the road. 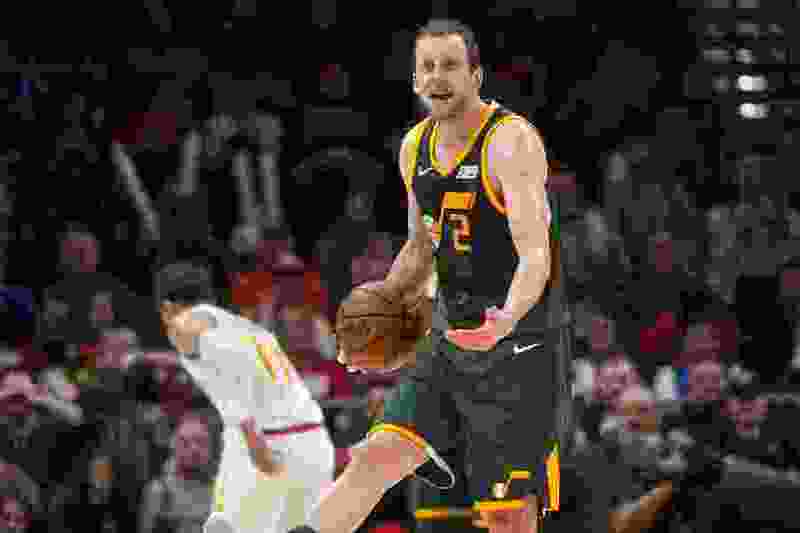 Whether it was due to fatigue, the scintillating talents of a young and talented Atlanta Hawks squad, or simple lack of execution and focus, the Jazz’s defense was unable to stay consistently on point throughout the night. The biggest sign of this was the number of open threes that the Hawks got a chance at. They shot 40 attempts from distance during the game, making 19; nine different Hawks made at least one. Whether it was in transition or pick and roll the maze of screens set for Kevin Huerter and Trae Young, the Hawks’ shooters got open early and often. At one point, they were even shooting 12-of-20 from deep. “They are going to make some shots, but they have to be contested,” Jazz head coach Quin Snyder said. • After a dominating third quarter, the Jazz let the lead slip in the fourth through a series of defensive mistakes. • Donovan Mitchell had a sensational first three quarters before shooting 3-11 in the fourth. • The loss puts the Jazz in a four-way tie at 42-30 among seeds five through eight in the Western Conference. But it looked like the Jazz were going to be able to survive the early barrage thanks to an impressive third-quarter turnaround. The Jazz came out of halftime looking to prove a point, immediately going on a 9-0 run on the back of their steals and blocks leading to transition opportunities. Then Donovan Mitchell took over, showing his complete array of difficult layup finishes on both sides of the rim, floaters from every distance, and of course, the deep jumper. Mitchell had 28 points through the third quarter, playing at his very best. The Hawks adapted, though. 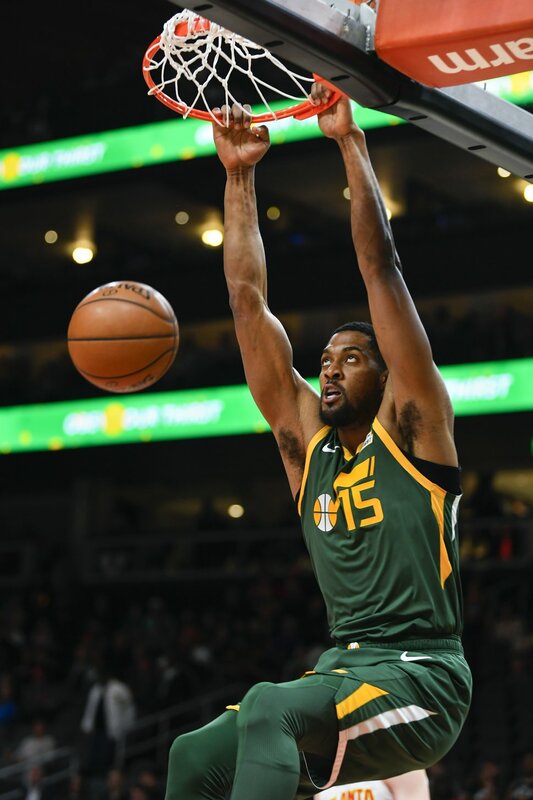 They came back from a 9-point deficit through — once again — the 3-point line, as the Jazz’s defense got a little bit lax once again. And the offense stopped working smoothly; Mitchell struggled in the fourth, forcing up some bad shots and shooting 3-of-11 in the quarter. “It just took us a little bit to get going, but we figured it out. They were hot, then they got cold, then they got hot again late,” Mitchell said. The end result: a close final two minutes where the Jazz didn’t come out on top. The Jazz took a 1-point lead after Ricky Rubio’s layup with a minute left, but then Trae Young’s floater wrestled the lead back for Atlanta. After a Jae Crowder 3-point miss — Crowder shot 0-for-6 in the game overall — Rudy Gobert missed a chance to get a rebound and ended up goaltending a Dewayne Dedmon hook shot. With the Hawks holding onto a 4-point lead, chaos ensued. Crowder turned the ball over, but then forced a Hawks turnover, a play that resulted after some scrambling in a Gobert alley-oop. From there, the Jazz were forced to play the free-throw game, and it almost worked out. Dedmon made three of his four free-throws, but Kyle Korver was fouled with a 3-point deficit while shooting the ball. A review confirmed, though, that Korver’s foot was on the line during the shot. Korver, one of the NBA’s all-time best free-throw shooters, missed the first one, forcing him to miss the second intentionally. Mitchell crashed in for the offensive rebound, but his attempt at a game-tying three ended up a few inches wide of the center of the net. Rookie Trae Young led the Hawks with 23 points, while Mitchell finished with 34, albeit on 32 shots. Rubio added 17 points and seven assists to the Jazz’s cause. The loss tightens the Western Conference even further: seeds five through eight are all tied with identical 42-30 records. “The teams are different, the West is different than last year. It is even tougher, so we just have to continue to build,” Mitchell said. KEY MOMENT • With a chance to tie the game, Kyle Korver’s feet were on the 3-point line as he was fouled, giving him only two free throws. After missing the first, Korver’s intentional miss was rebounded by Mitchell, who missed the last-chance heave from the corner. BIG NUMBER • 19-40. The Hawks’ found themselves open early and often from the 3-point line. WHAT’S NEXT • The Jazz wrap up their 4-game road trip by playing the Chicago Bulls on Saturday at 6 p.m. MT.